It's that time of year when everyone starts spring cleaning, weeding out things from their collections, and trying to make a few dollars selling them to others. So Friday, Saturday, and Sunday...get out there and start looking! Last week I hit a few yard sales and found some cool items. This little grouping of items. The bag is from Baby Gap and will make a perfect tote bag. I saw this and snapped it up. Love the pink butterfly and flower pattern. Will go well with our existing set (an eclectic combination of course). And now we will have a proper creamer and sugar bowl. A plate and 2 saucers to match our existing tea set. Finding cups would have been better, but I couldn't pass these up. What for? It's still early? We have the corrections for the Hobbit Hearthwarmer and I want to surprise Xyra. Okay. Let me get my slippers. I have the glass pot and Katherine's instructions right here. I'll read and you do the brewing. So we were waaaayyyyy off on the measurements. We need 2 teaspoons per cup and Xyra's travel mug holds 2 cups. Got it...4 teaspoons of tea in the pot. It's looking a lot better than our first try already. Done! Let's taste it before we get Xyra's travel mug ready. Still smells wonderful. All the spices wake me up and relax me at the same time. This is really good without anything in it at all. But it is still so very creamy and comforting with a little milk. The cinnamon and other spices that are in this blend make it very comforting - like hot cocoa - but tea. What do you like to drink on dreary days (weather wise or emotionally)? 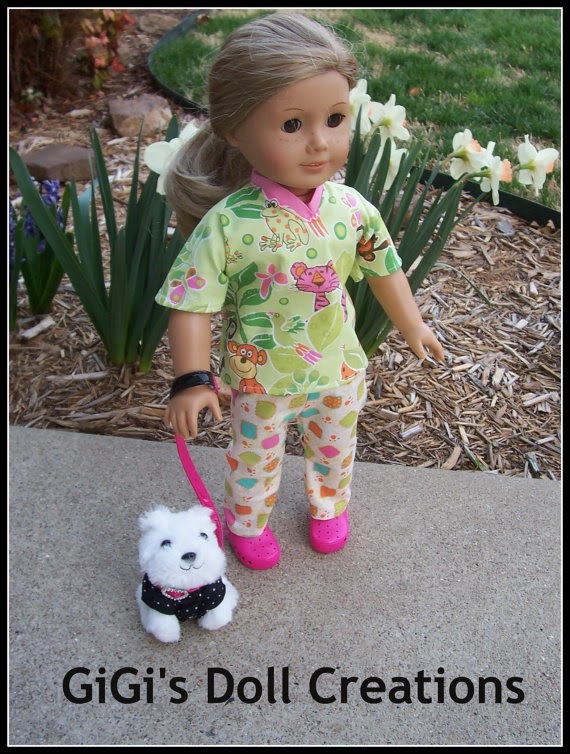 We were checking in at Doll Diaries, so many great things there, and we saw this great outfit from Gigi's Doll Creations. We missed doing a Memorial Day post for you this year, but Independence Day is right around the corner and this would be perfect for those picnics. Head over to the Doll Diaries post to get all the details and rules. 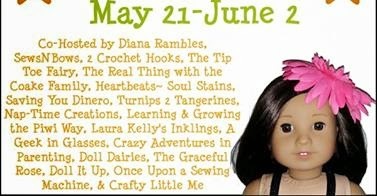 Also head over to Gigi's Doll Creations to find your favorite outfit for your mandatory entry. Then tell all your 18" doll loving friends! I love the Nutcracker. It's a great story and a perfect setting for a dancing school. Isabelle and her cast-mates are brave for doing this production. It was interesting to see the different things Jade and Isabelle struggled with. This was a great read, would be better around Thanksgiving. I have one issue...there is a scene where Isabelle talks about giving Tutu pepperoni from their pizza. That is a big NO NO! The spices that go into making the pepperoni and pizza sauce can cause kidney damage in cats and dogs. No garlic or onion for our furry friends. Only a blink of Luisa. I really want to know more about her. Overall, I liked seeing how Isabelle and the others prepared for a big production. This is a fun story. Isabelle helps those around her in many different ways - everyone from the adults to the smaller kids. She gets help from them too. She is very thoughtful. I can't imagine having to crawl across a stage under a skirt while wearing my own bulky costume. I have a new appreciation for what performers go through. It was so exciting for Isabelle to really meet... Oops! Almost gave a spoiler. This is a good read. I liked this one better than the first. Here the self doubt and nervousness sounded more genuine and was better placed. Detractors will note a few of the plot points to be unlikely or unrealistic, but there are cases where true talent in young people is recognized and appreciated by adults so I feel they were okay. If you have read the book and are not sure what I mean, then those plot points set well with you too. At the end of the first book, Jade and Isabelle (and many of Isabelle's friends or classmates) are cast in The Nutcracker. This book focuses on the rehearsals and time leading up to the big day as well as the first big performance of the holiday season. We get to see Isabelle battle her inner demons with help from the adults involved with the performance. It is interesting that the first book focuses on daily life at school and here (except for a math quiz) we only see the rehearsals for the Nutcracker. Are they working on this at school? Instead of school? In addition to regular school classes and dance classes? The secondary and tertiary characters are very flat. I really want more from and of the best friend, Luisa. She is a best friend and could be very well rounded and more present than she is. The trickle down advice is really great. Isabelle is not afraid to take advice from the other people in her life including the adults. She takes their help to heart and even uses it to help others. Very impressive and very mature. Like Jackie...I give Isabelle a thumbs up. Isabelle's love of dance and design provide a depth of skill and interest that will help her later in life. She is very talented and if something should happen to her dance career, she has a great fallback option. Good book two. On to book Three. Thank you, Emily at AG Fan Forever 101, for the nomination. I/we greatly appreciate this honor. This is a fun getting to know you type of award. Everyone keeps thinking up great questions. These are the questions Emily posed. 4. How old is your oldest doll? Out of the above mentioned 5, Melody. She is an American Girl of Today from 2000. 5. 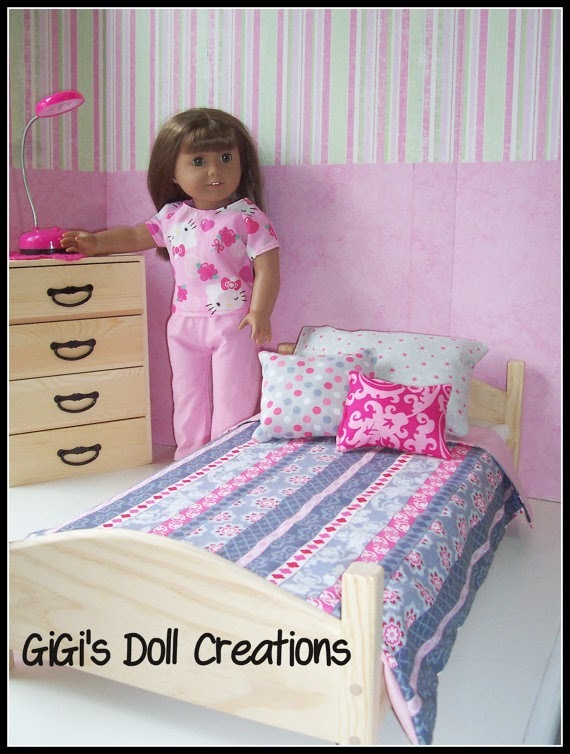 Do any of your friends like AG dolls? 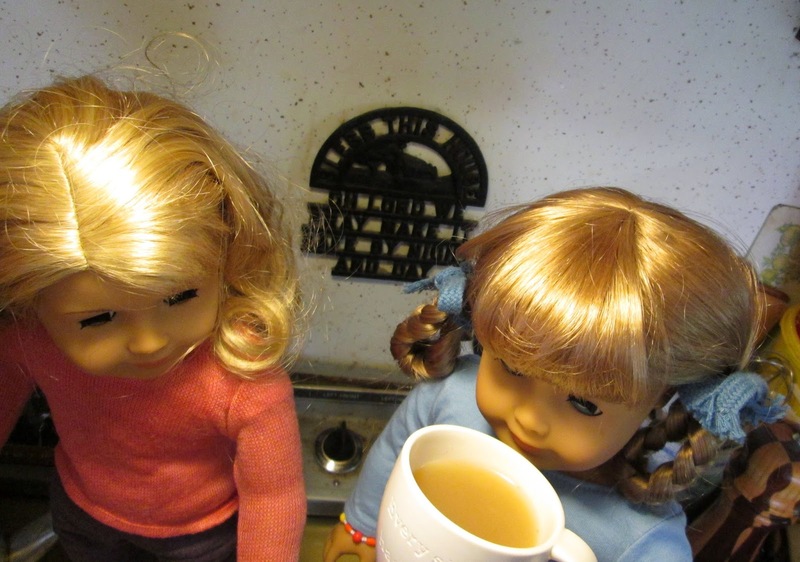 I do have a few friends that have AG dolls in their collection. 6. How many AG places have you gone to? Sadly, none. 8. 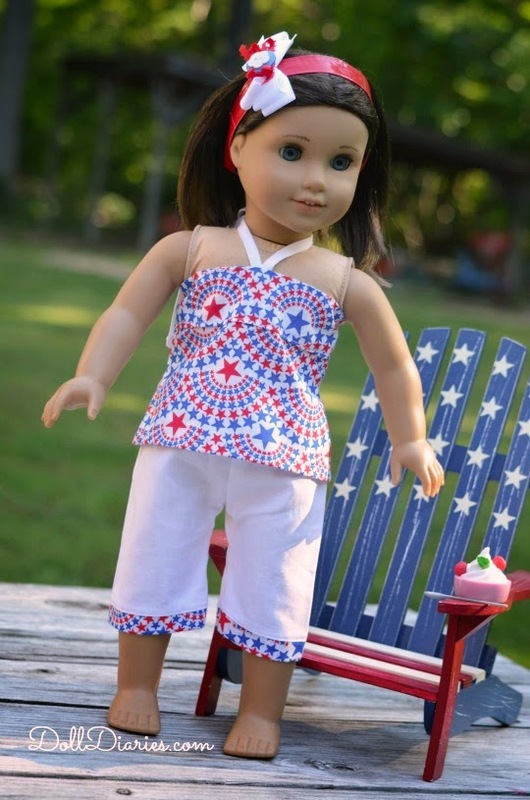 What's your favorite thing about AG dolls? The facial expressions are very pretty. 9. 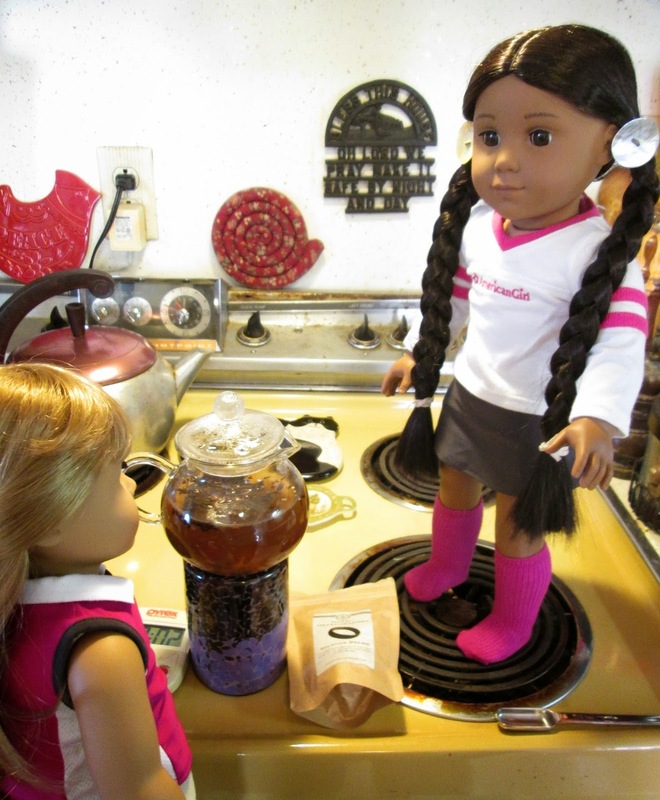 What's your least favorite thing about AG dolls? I’d like to see more ethnicities represented. 11. 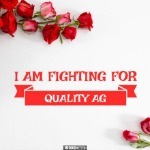 What is your favorite AG blog? I have many. I look forward to seeing new entries by all the blogs I follow. So many blogs have been nominated for this award, I think I may duplicate if I continue the nominations. Instead I'd like you to pick your favorite 4 questions from above and answer them in a comment below. 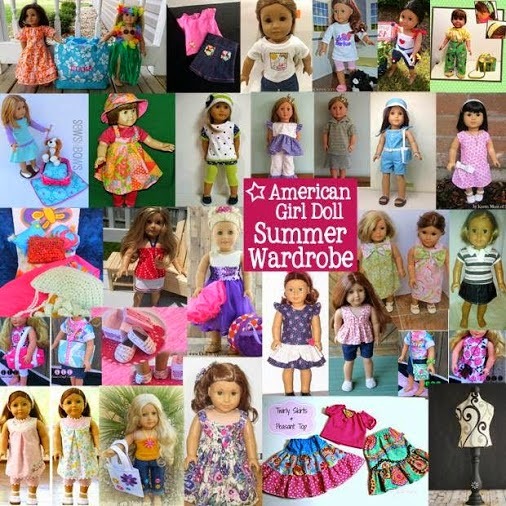 Doll Diaries and other great bloggers and crafters have put together a fabulous summer wardrobe giveaway. It's worth $595, and is filled with lots of great things! The giveaway is open to US and Canada residents age 18+. It's really chilly this morning. I think we need some hot tea. Getting ready to make morning tea. Not sure. Let me see what we have. Oh, hey! We haven't opened this one and it sounds perfect. Hobbit Hearthwarmer..."A cinnamon toffee black tea sure to be found at any home in the shire." I've got the glass pot. I'm opening the package...look at all the bits and bobs and leaves. Hmmm, no instructions on this one. We'll have to guess. One heaping teaspoon in the pot. It's not getting very dark. Cool, someone is making tea! Two more minutes to go. There. It's ready let's pour out. Looks like a golden green tea. Tastes...smooth. Kind of like wrapping up in a warm blanket. Maybe a bit of sugar and milk. Hmmm, we used too much sugar. You know, it was my idea to make tea. Yep, we added to much sugar. The milk makes it creamy. Still not sure we got this one right. What do you think, Xyra? I think...this is a good start, but we do need some help with this one. I'll e-mail and ask for some tips. Fill your cups and let's go. Xyra aside: In writing this review and looking up the links for you, I confirmed we used way too little tea for this first try. We will try again and update as soon as possible.